Every culture has its beans and rice. Every. Single. One. An invaluable cornerstone of almost any region’s cuisine, you can – and will – always find beans… and rice is rarely that far behind. In Indian culture, you find garbanzo beans… your chickpeas. In Latin American cuisine, you see lots of love for kidney beans and black beans. In Japan, adzuki beans. In France, the navy beans. Brought from Africa to the Low Country of South Carolina… you have black-eyed peas. And, of course it was paired with rice. Beans and rice weren’t always about, as one intellectually listless TV pundit put it, feeding the poor. Rice, prior to being the hyper-processed, genetically-modified mutant it is today, was much more like the long-grain brown rice we know of today than anything else, and it wasn’t cheap. The “cheap” part came to this country with slavery, as West Africans were specifically targeted for their knowledge of rice cultivation. The pairing of the two was actually quite reasonable: rice could easily withstand the cooking process of sitting in a pot and soaking with beans for hours on end. Toss in some peanuts or a piece of fat back for both fat and flavor, and you have a fully filling meal. But what about the nutrition? A pot of simply rice and beans can’t possibly be nutritious, can it? That small slab of pork, the throwaway cut of pork from the backside of the hog, the… fatback, if you will, also didn’t look like what it does today, nor was the fat as toxic as it is today. Adding fat to a pot provides texture – it can transform “watery” into “velvety,” “gritty” into “creamy,” and “dry” into “delicious.” It makes that hard, rough rice fluffier, and transforms the starchy broth from those beans into a creamy base for a traditionally hearty dish. And, before we challenge the necessity of fat, remember: fat is essential to the every day diet; a daily intake regimen devoid of fat means at least four vitamins – A, D, E and K – aren’t being absorbed by the body properly. Carbs, protein, fat… antioxidants, nutrients… I’d say that scores. How you spiced your beans and rice… well, that depended on where you were from. One thing that remained consistent in all of the old recipes I got my paws on – the salt was minimal. Your fatback, bacon, whatever – should’ve been salty enough, which, would’ve forced you to be mindful of just how much of that fatback you cut into your pot. Properly preserved meat would’ve been coated in the stuff… and you wouldn’t want to create something inedible. Besides, you’ve not got much money… why waste the little fatback you’ve got by being greedy? 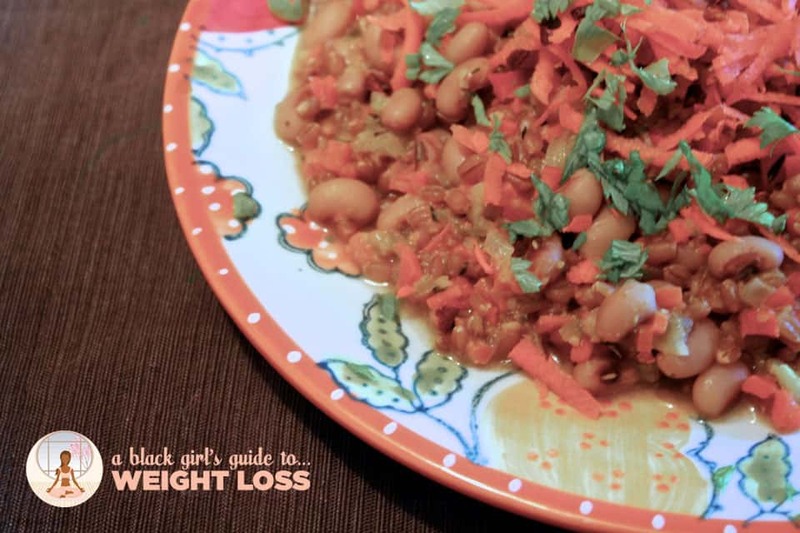 Though Hoppin’ John – the name for the traditional southern soul food dish of black-eyed peas and rice – “came over” from West Africa with the slaves, it wasn’t always merely a “staple” dish. Since the slaves were responsible for feeding both The Big House and their house, many were growing food just as fine for themselves as they were for their owners. Oysters, possum, ham, raccoon, venison, turkey… there was, without a doubt, variety to be had by many. And where, prey tell, did it get its name? Though many like to wax historic about old men on crutches, energetic children, polite invitations (“Hop in, John!”); the most sensible answer comes from France – as the French referred to black-eyed peas as “pigeon peas,” or “pois-de-pigeon”, a slave listening closely to a francophone could easily mis-hear a quickly-spoken “pwah-deh-pee-zhon” as “hopping’ john,” and simply leave it at that. Besides, who cares? If the food is good, hush up and eat it. Many cultures, in fact, eat beans and rice for New Years Day, as a means of living out the old phrase “Eat Poor that day, eat rich the rest of the year.” As the slaves of that time were, without a doubt, the creators and deciders of southern cuisine at that time, how they ate it determined how everyone else ate it; and when slaves began to acquire their freedom, the popularity of the dish migrated. …and everyone does it differently. In some pots, a freshly-wiped, shiny dime was dropped into the center, and the person who found it in their bowl was certain to experience better luck in the coming year. With rice for riches and beans for peace, you could add a leafy green for wealth – who wouldn’t want more leafy green in their wallet? Your first – and most important – requirement is a giant pot. A pound of brown rice, a pound of soaked-but-uncooked black-eyed peas, and a half a pound of pork? If you don’t have a pot large enough to accommodate all that, you’re going to hurt your own feelings. In a pot, you drop your pork and cook it thoroughly. Once oil begins to accumulate in the bottom of the pot, you can drop in a whole onion, fully chopped. Once the white of your onions is faded, and they look more see-through than raw, you drop in your thyme – a full on three or four sprigs of fresh, or a couple of tablespoons if dried, and trust me… it really doesn’t matter how much you wind up dropping in there – and pour in a quart (four cups) of water. Bring your water to a boil, then carefully pour in your beans, bringing your stove heat to medium-high… and let them cook for at least an hour before adding your rice. Throughout that time, keep an additional pot of water on medium heat, and add to your pot if it becomes necessary. After an additional half hour has passed, check your pot to see whether or not your beans and rice are thoroughly cooked. The standard test is that you should be able to bite into five beans, one at a time, and all five should be cooked through. You should be able to stir through your rice and taste it in various spots to determine doneness, which feels like defined grains with a tender texture on your tongue. Of course, you can always combine canned black eyed peas with freshly-cooked rice, onions, herbs and bacon… unless somebody’s in your kitchen judgin’. Then, see above. And ask yourself why they’re so judge. Lots of people add lots of different things to their Hoppin’ John – thyme, rosemary, black pepper and fresh flat-leaf parsley is my favorite herb and spice combination for this. The more savory, the better. But also, because I’m weird and refuse to fully follow a recipe, I swapped out the brown rice for wheat berries and added raw carrot to the final plated dish. Because I like fiber. Also, since I’m not a pork eater, I skipped the meat entirely – as evidenced above – and simply sauteed my onions in a couple of tablespoons of organic canola oil, and added a couple of tablespoons of peanut butter to my boiling water prior to adding the beans. It’s delicious. Don’t ask questions. Either way, Hoppin’ John is a dish with a long, rich, nutritious legacy, superstitious as it might be. Whether the meal has ever actually made anyone rich is beyond me… but having a giant pot of black-eyed peas and rice in your fridge to last you the first few days of your year can certainly help you save a few pennies. And, of course, because I’m cheap… that works for me. How are you seasoning your Hoppin’ John tonight? I love beans and rice. Today I will be making pinto beans and cilantro lime rice. Of course, I will be adding a purple vegetable to the mix. I am vegetarian and try to focus on legumes to be my protein instead of soy meat. The meatless version sounds wonderful, and will be tried very soon! Wishing you a happy, successful, healthy year! Happy New Year. I will have them with some brown rice and onion rings with a vibrant salad! I am the Forest Gump of beans with no shame! I’m having pinto beans flavored with bison bacon, garlic and a bit of onion-delicious!